Learn about our Vision, Concept, History and more. Having been in process since spring, Rimligt Social finally has gone public on August 1, 2012. This joint-venture of Anders L. Hansson and business partner Matteus Åkesson is aiming for new and more business-focused ways to sell and implement internet presence and social media in companies and organizations. Rimligt Social guarantees presence and continuous activity for companies and organizations in the digital world. Matteus Åkesson has a background in sales, market research and business development. He is a familiar profile in business circles of Skåne, in particular in Malmö and Lund. Anders L. Hansson has his background in analysis, public affairs / PR and international business development. After several months of preparations, Annors Development last week received a dozen of editorial writers and journalists from Sweden in Barcelona. Before leaving the Catalan capital today, Anders L. Hansson held meetings with local contacts. The objective of the editorial writers was to learn more about Catalan and Spanish politics and society. The program encompassed seminars and discussions with politicians, city developers, business people and representatives from a newspaper as well as public service TV. 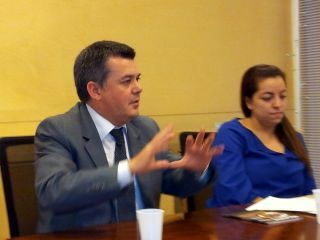 Carles Llorens, General Director, and Aouatif Stitou, Assistant, at the Catalan Agency for Cooperation and Development. After ending the intense program for the editorial writers, Anders L. Hansson proceeded to have meetings with contacts in business and politics, including Annors Development's long-time business partner Sergi M. Gil Puy of Asgard Consulting. In the months to come, several business projects between Catalunya and Scandinavia will be developed further. Watch a brief audiovisual presentation of the program which Annors Development compiled for the editorial writers here. For the first time ever, Folkemødet was arranged in Allinge, on the Danish island of Bornholm, from 15 through 18 of June. Annors Development was there in order to make new connections and gather information for up-coming projects. Folkemødet is a concept that has been developed from the Swedish version, known as Almedalsveckan. Basically, the idea is that politicians, business, NGO's and any citizen, come together for free-of-charge seminars and encounters. The centerpiece, in Sweden as well as now in Denmark, are the daily speaches by the leaders of the political parties, including the prime minister. - Folkemødet represents a unique opportunity not only for Danish business and politics, says Anders L. Hansson. Representing Annors Development, I'm here to learn about Denmark, but also because Folkemødet is likely to grow into a vital meeting point for Skåne/Scania on one hand, and Bornholm/Denmark on the other - for business as well as politics. Folkemødet will be arranged again in June of 2012. More reading - Anders L. Hansson's column on the editorial page of Skånska Dagbladet - click here. Well aware of the fact that Poland is one of the strongest growth economies in Europe, Anders L. Hansson traveled to Warsaw for discussions on a business proposal. - In 1996-1998, I studied at the Jagiellonian university - that's in Kraków, in the south of Poland, Anders explains. Already in 1989, I had my first contacts with our southern neighbors, and as a professional, I dealt with Polish government employees in the early 2000's. In 2009, I developed my business network in Slovakia, and as I now got an opportunity to meet with business people also in Poland, I didn't hesitate. For sure, language and culture may be a challenge, but the reward for doing business here can be great. Annors Development is currently investigating opportunities within a European-international business consultancy. One of their most successful branches is the one in Poland. Anders L. Hansson met with its CEO, following earlier discussions with the European HQ of the company. - In today's internationalizing economy, even small and medium-sized companies need to work cross-border. Lacking resources of their own, there's a rapidly growing need for truly international business consultancies, Anders sums up. Southern Sweden's leading PR and Communications agency, Aspekta AB in Malmö, has contracted Anders L. Hansson for a period of five months, starting today. - I've been sub-contracted to assist in a number of projects, Anders explains. With the business and PR experience I've gathered through Annors Development, I hope to be a valuable contribution to Aspekta's already impressive team. The contract encompasses projects for the public sector, organizations and private companies. Tasks will include project management, coordination, production of seminars and events (Almedalsveckan etc. ), production of newsletters, press releases, business intelligence and analysis, media intelligence and media analysis, prospecting and networking, customer and sales meetings. Parallel to his commitments at Aspekta, Anders continues to run some separate business activities at Annors Development. Mr. Mikael Stamming, Director of the Öresund Committee, paid a two day visit to the Government of Catalunya for discussions on interregional and crossborder cooperation in Europe. 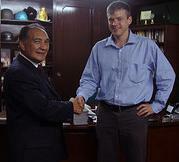 Anders L. Hansson accompanied Mr. Stamming and was also responsible for the thorough preparations. - Yes, Anders says, I was commissioned with this project already in April this year. Having had contacts in Catalan and Spanish business and politics for quite a few years now, my conviction was that I could bring in a substantial contribution to the crossborder integration in the Öresund region, by connecting the Öresund Committee to counterparts in Catalunya. - Scania, the Öresund region and Catalunya show some interesting similarities as well as differences, and I believe there is a lot to learn from one another, Anders continues. Therefore, we have met not only with government officials here, but also business people and representatives from various organizations. Mikael Stamming, Director of the Öresund Committee. Anders L. Hansson, Annors Development. - The Öresund region and Catalunya both have a lot to gain by tearing down state borders. Economic and cultural development in these, as well as many other border regions, has been counteracted by centralization. Today, goverments can no longer afford this and hence we live in an era of regional revival, Anders sums up. The already operative joint-venture of Katikka Gasper Ståhl and Anders L. Hansson, announced earlier this summer (see article below), has been named SceltoChoice and is now present also on the web. - The company name is a game of words, Katikka explains, ”Scelto” is Italian for ”chosen”. SceltoChoice is a company focusing on Diversity Management. We have expertise in project management, recruitment and competence development - with a Diversity approach, meaning we provide options to our customers – but they have the choice. Katikka has taken on the position as CEO, while Anders assumes his duties as a Senior Consultant. Even though SceltoChoice will take most of his time, Anders will continue to run Annors Development alongside. On the web, SceltoChoice can be found at www.sceltochoice.se . At a meeting in Lund today, Katikka Gasper Ståhl and Anders L. Hansson agreed to join forces. By setting up a business together, the two entrepreneurs count on mutual benefits by complementing each other and building on their respective strenghts. - Indeed, Anders underlines, Katikka has recent in-depth experience of local business life in Skåne / Scania. Combining that with my international network and experience in analysis and communication creates a true ”combat team”. Anders is at home in several European and non-European countries, with thorough knowledge about Germany, Poland, Slovakia, the U.S. and more. In recent years, he also developed projects in Spain and Stockholm. - Managers have to understand that their staffing has to correspond to the markets they’re aiming for. In short, a global market creates a need for a cross-cultural approach to all aspects of business life, not the least when it comes to human resources, Katikka says. The new company will be headquartered in Lund, but Malmö, Copenhagen as well as most of Scania and the Öresund region will be considered home market. Apart from Anders L. Hansson and Katikka Gasper Ståhl, the company will involve a number of additional consultants. Once again the regional government of Scania, Region Skåne, organized the annual Scanian Development Day. A day filled with insights and knowledge, fundamental for the exciting development that Scania and the Öresund region expect for the coming years and decades. Among the numerous participants, that filled the charming Theater of Ystad, was a great share of Scania’s most influential politicians and other decisionmakers. The proposed regional development program formed the theoretical platform for the event, and to support the draft program with facts and opinions, a number of well-known and interesting speakers were invited. Among these: Sweden’s minister for Öresund integration affairs Christina Husmark-Pehrsson, several university directors, weatherman Pär Holmgren and others. MD Professor Hans Rosling of Karolinska Institute, co-founder of Doctors Without Borders and founder of his own thinktank Gapminder, gave new perspectives on global development and how we all are interconnected and dependent on eachother. Anders L. Hansson was present in order to pick up on the latest in Scanian development, and also used the opportunity to intermingle with new and old friends and acquaintances. Annors Development continues efforts in the wine business. Anders L. Hansson meets with Ricard and Julieta from Mas Foraster winery. - Food is fun! Here at Alimentaria you get a fantastic overview of industry developments, and Barcelona offers a great ambience for networking. During daytime strawling through the sector exhibitions, and at night meeting with new-won and old contacts in the city's famous restaurants. It doesn't get any better than that, Anders says. 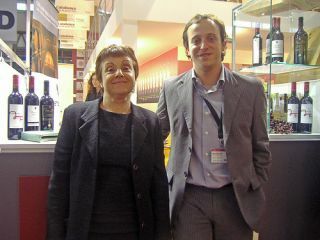 Ms. Julieta Foraster and Mr. Ricard Foraster at their exhibition stand - Alimentaria 2008. - Yes, here I have an excellent opportunity not only to check out the competition, but also to organize meetings for potential distributors of the Mas Foraster wines. Julieta and Ricard Foraster are gaining lots of appreciation with their ambitious wines, now it's only a matter of finding the adequate distribution channels, and that's where Annors Development comes in, Anders explains. With 5,000 leading food and beverage manufacturers as well as distributors, and 158,000 professional buyers from five continents, Alimentaria 2008 reached all-time-high once again. The completion of the new exhibition halls and improving communications is part of the explanation behind the success. Gigantic airport and subway investments will soon make Barcelona an even greater location for fairs and congresses, so the road is being paved for the next Alimentaria to take place in March 2010. The prize-winning Mas Foraster winery has signed a contract with Annors Development. The objective is to find efficient distribution channels in Scandinavia. After a recent visit to the Mas Foraster winery in Montblanc, in the Catalan wine district Conca de Barberà, Ricard Foraster and Anders L. Hansson reached an agreement on cooperation. The first step will be an analysis of the Scandianavian market, to be followed by concrete search of business contacts. Within short Anders will be visiting wine distributors in Sweden. Together with business partner Sergi M. Gil Puy, Anders L. Hansson from Annors Development today met with top management of the private CIMA hospital in Barcelona. The aim is to find a way for further internationalization of the high-quality services that CIMA offers. During the meeting at CIMA, the well-equiped and ultra-modern facilities were visited, before sitting down to discuss details. CIMA, famous for performing the annual health-check of Spanish king Juan Carlos I, offers a wide range of services according to highest international standards. 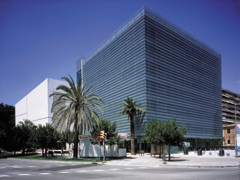 The award-winning main-building of the CIMA hospital in Barcelona. From a business point-of-view, however, internationalization is of interest only in areas where patients will find it feasible traveling to Barcelona for treatment. Such services could include advanced medical check-ups, IVF as well as different kinds of surgery. X-ray analysis is a service that can be performed on distance, using the Internet. In a couple of weeks, Anders L. Hansson will hold meetings in Scandinavia to further investigate demand in the international market for healthcare. Barcelona has an unsual concentration of advanced clinics and hospitals, both private and public, as well as comprehensive medical research. In fact, Barcelona is considered the most important healthcare cluster in the entire Mediterranean region. With its international character and easy access by air, Barcelona forms an attractive option for patients from all over Europe as well as the Middle East and Africa. As The Spanish-Swedish Chamber of Commerce in Barcelona gathered for its annual General Assembly, Anders L. Hansson was elected a board member. A wide range of members had come together in the exclusive settings of Reial Club Nàutic in the harbor of Barcelona. A briefing on last years' activities as well as the financial situation, was performed by the Chamber's director Annika Tingström and treasurer Lars G. Jonsson. Reial Club Nautic in the harbor of Barcelona. - I'm proud to have been given this chance to further assist in tightening the commercial bonds between Catalunya and Spain on one hand, and Scandinavia on the other, Anders says. Having my origin in Scania, the southern-most region in Sweden, connected to Denmark's capital by a 20-kilometer-bridge, I find it obvious that our Chamber has to be something more than just Swedish. Scandinavia and the Nordic countries are more and more being considered as one market. After the conclusion of the General Assembly, Mr. Mats Lindgren, founder and CEO of Kairos Future, gave intriguing insights to the megatrends of the world. The Spanish-Swedish Chamber of Commerce in Barcelona was founded in 1988 and now has more than 170 members, including large companies as well as individuals. Yet another significant food and beverage fair has taken place in Barcelona. 525 exhibitors and 42.000 visitors attended the second edition of Barcelona Degusta. - Having visited Alimentaria Barcelona last year, one of the world's leading food and beverage fairs, screening Barcelona Degusta is a terrific compliment, Anders L. Hansson explains. The variety of products is impressive, and so is the number of innovations. Also, you get a good feel for the way that producers market themselves toward the end-consumer. Some of the delicious cheese that Catalunya has to offer, including cheese in olive oil. Picture from one of the stands at Barcelona Degusta. The 2007 edition of Barcelona Degusta demonstrated a growing international interest, with exhibitors coming from all over Europe and Latin America. - Scandinavian producers and buyers would have a lot to gain from increased presence at Alimentaria and Degusta. I believe it would make a lot of sense to connect Catalunya's and Spain's avantgard cuisine with northern Europes efficient food industry. Annors Development promotes international food trade and know-how exchange, and I intend to make a personal contribution to make this come true, Anders concludes. Some 50 curious people gathered for a business luncheon in Barcelona as Sweden's embassador in Spain came to town. Yet again, The Spanish-Swedish Chamber of Commerce in Barcelona has organized a much appreciated luncheon, this time featuring Mr. Anders Rönqvist, Sweden's embassador to Spain. The topic of the day was current politics in Sweden, following the general elections in September and the subsequent change of government. Mr. Anders L. Hansson, Ms. Margareta Gustafsson, representing The Swedish Tourism Council at Mallorca, and Mr. Anders Rönqvist, Sweden's Embassador to Spain. Photo by courtesy of The Spanish-Swedish Chamber of Commerce. Annors Development was present at one of the world's leading fairs for the hotel and restaurant industries. 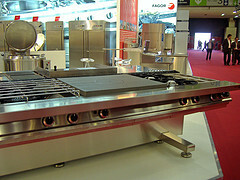 Kitchen machinery, electronic equipment, coffee and famous chefs were all important parts of this event. First held in 1981, this was the 13th Hostelco fair in Barcelona. As expected, the event continued to grow, and now reached 100.000 trade visitors and 2.300 exhibitors. Internationalization continues, and exhibitors came from 42 countries. - International exchange is an obvious must in tourism. Spain is a world leader in this field, and there's plenty to learn for foreign companies, says Anders L. Hansson. Considering this, it's surprising that the international presence here isn't even bigger. Ten per cent of visitors were foreign, coming from 104 countries. 79.5 per cent came from EU countries, with France heading the ranking, followed by Portugal, Italy, the United Kingdom and Germany. - I believe there's a lot to learn from the success, as well as failures, by the Spanish tourism industry. Not the least, that goes for countries in northern Europe that have a great tourism potential. - Spain offers not only experience, but also a variety of advanced equipment, such as tailor-made kitchen machinery, Anders continues. Annors Development intends to assist in bridging the gap between supply and demand. Hostelco 2006 was subdivided into a number of sectors, some of them being Equipment and machinery, Management, control, computer systems and security, Fabrics and clothing, Furniture and furnishing, Food and beverages, Equipment and products for laundry, dry cleaning, hygiene and general cleaning as well as Vending. Also, a number of conferences and seminars on related topics were organized. Striving for an ever-growing network, Annors Development has now become a member of The Spanish-Swedish Chamber of Commerce in Barcelona. Today Anders L. Hansson was introduced to the director, Annika Tingström, during a chamber luncheon. Anders also met with board members and Swedish as well as Catalan business men and women. - This one and all the other events organized by the Chamber are excellent opportunities to get further insights on Swedish-Catalan-Spanish business relations, Anders says. I am confident the membership will be another important component in building tomorrow's trade between the Iberian peninsula and Scandinavia. The Spanish-Swedish Chamber of Commerce in Barcelona started in 1988. It's an independent organization, targeting Sweden-related business in Catalunya. The Chamber has some 120 members. At an event organized by Catalunya's leading political party, Convergència Democràtica de Catalunya (CDC), Artur Mas had a brief conversation with Anders L. Hansson. Some 60 CDC-members took part at the event that was held at the party's venues in down-town Barcelona. 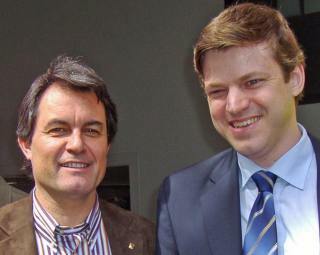 CDC and Unió Democràtica de Catalunya (UDC) together form a party federation called Convergència i Unió (CiU). Since democratization of Spain and for almost a quarter of a century CiU led the government of Catalunya. In opposition for the past couple of years, CiU and its president Artur Mas have been playing a significant role in achieving extended regional autonomy for Catalunya and its seven million inhabitants. Artur Mas i Gavarró and Anders L. Hansson. For five full days they met in Barcelona: manufacturers and distributors of foods, soft-drinks, beer, wine as well as companies specializing in the needs of restaurants. 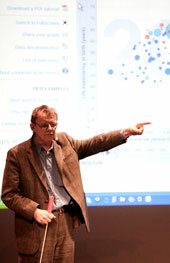 - Since the Alimentaria exhibition is breathtakingly big, I've had to focus on a few sectors, Anders L. Hansson admits. But with Alimentaria being divided into a number of sub-fairs, such as frozen products, soft-drinks, meat, and hospitality products, it's easy to find what you're looking for. The 2006 edition was bigger and better than ever before. Using the entire Barcelona fairground, there was room for some 5.000 exhibitors - from 70 countries - and 152.000 professionals visiting. A great share being from around the world, Alimentaria consolidates its leading position in Spain, and continues to rank among the world's most important food and beverage fairs. - Through recent contacts with Livsmedelsföretagen (The Swedish Confederation of the Food and Drink Industries - LI) and The Federations of Swedish Farmers (LRF), I have a brief picture of the kind of business that could be worth looking for. So I'm here partially for that reason, Anders explains. - Annors Development promotes international food trade and know-how exchange. I believe it would make a lot of sense to connect Catalunya's and Spain's avantgard cuisine with Scania's and Sweden's food industry. Also, I see opportunities in Sweden's high quality farming products and in the retailing business, Anders concludes. So, which were the highlights of Alimentaria 2006? Really to many to mention. 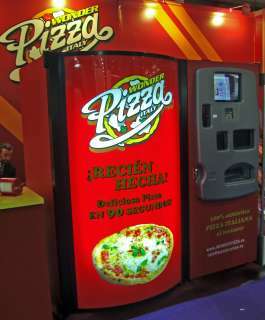 But here at the left you can see one of the innovations presented to the visitors: Wonder Pizza. Throw in some coins, and in 90 seconds you'll have a full-blown Italian pizza coming out! - Delicious, Anders assures, trying out the miracle machine. According to company representatives the machine is already out on the market in the United States. During his visit to Stockholm, Anders L. Hansson met with leading representatives of future-oriented industries. Knowledge-based, complex services, especially when combined with high-tech, is one of the corner stones in a modern economy. Sweden has an extensive educational system, and therefore a solid foundation for creating innovative, growth-generating businesses, capable to offer advanced knowledge-based services. - The discussions I've had in Stockholm this week clearly demonstrate that Sweden already has a number of companies offering the kind of future-oriented, complex services that everyone is calling for. The potential in terms of jobs and exports is enormous, Anders says. Technological progress is rapid, but even so, food forms an inevitable part of our lives. - Food can be very basic and food can be luxury. As prosperity grows, people ask for more elaborated products. 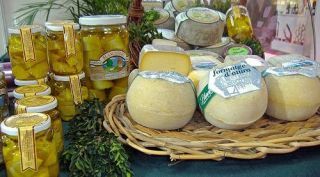 International markets demand new, exciting, innovative foods and drinks. Swedish farmers and food industries have a lot to offer, however, they oftentimes lack resources and know-how to get started in exports. - Our platform is strong, and our networks grow bigger each day. The industries we're in touch with need assistance that knows how to act both on the business scene and in the world of politics. This is precisely what Annors Development supplies. Today, Monday, Anders L. Hansson is leaving Barcelona for a two week journey to Malmö / Scania and Stockholm, for meetings with old and new contacts in business and politics. The purpose is to further develop Annors Development in the fields of Market research & Business Support, Key Account & International Sales as well as Analyses & Research. - Building on our broad international experience, in Europe and The Americas, topped of with our current positioning in Barcelona, Annors Development offers the kind of personalized attention that many small and medium-sized companies are in need of, Anders L. Hansson says. - There's an ever growing demand for international competence in business. In spite of Europe's political problems, economic integration continues, Anders summarizes. A row of meetings have been held with representatives of a company in the food processing industry. Annors Development continues its endeavours in international markets. Catalunya, with its capital Barcelona, is famous for its excellent cuisine. Numerous Michelin stars have been awarded to restaurants in the area. - The world's best cooks need a superior quality food industry, a vivid agricultural sector and a good political backing. Catalunya offers much of this, explaining the success and fame that this part of Spain has gained among gourmets and travelers, Anders L. Hansson explains. - But a lot remains to be done. Exports and imports can further drive the regional development. Annors Development offers on-site Market research, Business Support and Sales in Barcelona, something that foreign companies looking for opportunities in Spain could take advantage of. - My recent meetings with market and sales people from a Barcelona-based company in food processing, demonstrates the strength of Catalunya's industry. As they within short go international with their new innovation, Annors Development will offer its know-how in the Scandinavian and European markets, Anders sums up. This week Anders L. Hansson visited companies in Stockholm and Copenhagen to find out more about their needs for the unique know-how offered by Sicurex and ISVI, Colombia. Following a meeting in Bogotá earlier this fall, Annors Development now is researching the market in order to find out which services in security training, education and operations that the Colombian Sicurex-ISVI group can offer potential clients in Europe. During his visit to Scandinavia, Anders L. Hansson also met business leaders from other industries, as well as people from media and politics. During his current trip to Colombia, Anders L. Hansson held talks with the principal owner and president of Sicurex and ISVI, Luis Enrique La Rotta. Sicurex and ISVI are two companies within the same group. Together they offer a unique concept in the security industry, based on the so-called Metis Philosophy. The concept has been developed througout several decades. The group is ISO 9001-certified. - Colombia's rich natural resources, such as oil and a favorable climate, have contributed to the country's well-known problems with cocaine trade and guerilla activities. Organized crime is also wide-spread. At the same time, there is an immense economic activity and a rapid growth in some parts of Colombia. Big international companies are present. It's with all this in mind that one can understand the advanced security concept that Sicurex and ISVI stand for, Anders L. Hansson explains. - The security industry in Europe could gain great input from the know-how that Sicurex and ISVI offer in training, education and operations, Anders continues. - The Sicurex-ISVI group teaches and practices a full-blown security concept that starts out in a thought-thru theory taken to the highest operational levels. In the security industry this approach, which includes heavy cooperation with academics, is almost unknown. Hence, Sicurex-ISVI can be a most valuable complement in advancing the security industry also in Europe, Anders sums up. Sicurex is aiming for the professionalization of the security industry, offering training and education at all levels - from the beginning guard up to advanced management level. Sicurex cooperates with a respected university of Bogotá. Luis Enrique La Rotta (left), president of Sicurex and ISVI, meeting with Anders L. Hansson. Bogotá, Colombia, Oct. 2005. ISVI is one of Latin America's leading companies in security services, holding some of the most prestigous accounts in Colombia and additional countries. ISVI is a first choice option for multinationals setting up in the region, and also for residing and visiting VIP's in need of licensed bodyguards. Security consultancy and investigations form an integrated part of the services. ISVI possesses its own command center. A new step in the history of Annors Development is being taken today as The Projects Blog opens up. You may be familiar with the The Annors Development Blog which has been up running for quite some time now. “Europe of Regions - A World of Regions” is the focus that has found an extensive number of readers. Even though issues around regional autonomy and related topics is a specialty of Annors Development, there is quite a bit more to it. Since The Annors Development Blog ought to stay focused, The Projects Blog has been set up to cover other issues and special projects. Technically, The Projects Blog is a distinct creature, so if you would like to stay up-to-date with this new blog you need to subscribe separately. Welcome to inaugurate The Annors Development Projects Blog. As the summer comes to an end, another exiting season of tasks to take care of, problems to analyze and opportunities to benefit from appear in the agenda. Once again globalization, the European Union and business life will hit the headlines. And once again the topic of culture, in its deep sense, is likely to be exiled out of main stream media. That's too bad for those companies in search of higher profits, and for those politicians looking for ways to take economies ahead, thereby winning confidence and votes. However, there are good signs: in the latest issue of TIME (Aug. 29, 2005) the cover story brings readers' attention to precisely this topic, as it looks into the revival of minority cultures in Europe. Stefan Wolff, a professor at Bath University, says a distinct cultural identity is a competitive advantage - in tourism and elsewhere. Exactly! The interconnection of business and culture ought to be evident, and maybe it will someday. But to reach that point a lot of changes have to take place both in the ways that politicans and business people think and act. Annors Development is ready to assist in taking on this and many other challenges. We look forward to develop mutually fruitful cooperation with former, current and new clients during the time to come. Happy autumn! Member of the European Parliament, Mrs Lena Ek, invited a number of individuals from journalism, business and politics for a two day stay in Brussels. The purpose was to raise awareness on how the European Union works and how citizens, business, organizations and governments interact with EU institutions. - Considering the current turbulence in the European Union, it's encouraging to see that Europe still has politicians with visions. The meeting with the chairman of Alliance of Liberals and Democrats for Europe (ALDE), Mr Graham Watson was inspiring. Considering ALDE's wide-reaching aspirations in the field of human rights and its recent establishment as a force within the Council of Europe, I do indeed expect ALDE member parties to make progress in terms of connecting fundamental cultural issues with the struggle for regional autonomy, Anders L. Hansson - one of Mrs Ek's guests - says. - I hope that Lena Ek will be a bridge that can contribute in closing the gap between a Europe where respect for cultural diversity in many countries has been demonstrated hands-on, and a Sweden where those issues are almost un-discovered territory of today's politics. The program in Brussels entailed visits to parliamentary committees in session, discussions with representatives from the offices of West Sweden and East Sweden, The Confederation of Swedish Enterprise, The Federation of Swedish Farmers (LRF), The Swedish Confederation of Professional Employees (TCO), The Swedish Association of Local Authorities and Regions (SALAR), DG Enterprise of the European Commission, and Sweden's Permanent Representation to the European Union. Anders L. Hansson is now back in Barcelona and Catalunya for continued research on business and politics in the emerging Europe of Regions. The opposition coalition in Skåne gathered on Monday 13 June to discuss regional development. Anders L. Hansson was invited to speak on "Scania in Europe of Regions - From The Horizon of Catalunya". As Sweden's central government is positioning itself in discussions about the future structure of the state, regional leaders are showing an increased interest in regional autonomy issues. Skåne, the southernmost province in Sweden, and one of four provinces in the historic region of Scania, is no exception. Skåne's politicians are now seeking a formula for the future. - The more I learn about regional autonomy in Catalunya, the more possibilities I see for Skåne and Scania. If they can do it in Catalunya and Spain, then for sure it's possible to do it in Scania and Sweden. Scania is not condemned to submission, and Sweden is not condemned to eternal centralization, Anders L. Hansson argues. During the seminar of Skåne's opposition coalition, Anders presented a concrete model for regional autonomy. - It's a draft model that still has to be developed. But it can be used as a foundation for the rough political work that has to be done, is Scania going to succeed on its graveled road toward regional democracy. - Furthermore, the model is not only aiming at Scania. It is based on general principles that can be used also in other European regions, for example in Sweden, Anders summarizes. In order to improve understanding of security policies in a European and global perspective, Anders L. Hansson participated in a three-day conference for journalists. The site for the event was Vienna, the home to several international organizations. - It was enlightening to be present at a meeting of the Permanent Council of the Organization for Security and Co-operation in Europe (OSCE), Anders comments. In many ways this organization of 55 European, Central Asian and North American goverments seems to be a creature for solving yesterday's problems. No real discussion takes place, and fundamental problems of Europe's security are being burried under a load of well-composed, but content-free, phrases. - Long-term peace and prosperity in Europe and Central Asia can be safe-guarded only if innovative measures are being taken. This must involve continous consultation of legitimate regional governments as well as NGO's of various kinds, Anders suggests. The Vienna conference also featured meetings with representa-tives of the International Atomic Energy Agency (IAEA) and the United Nations Office on Drugs and Crime (UNODC). In addition, Anders L. Hansson held a separate meeting with Mr. Elmar Pichl, Head of the Policy department of the ruling Austrian People's Party (ÖVP). The topic for this encounter was Austria's approach to regional autonomy, i.e. the federal system and the changes that are likely to take place as a result of the recently finalized constitutional convent. Starting April 2005, Annors Development will maintain a blog as part of the company website. Thereby another step is taken to enhance visibility and show decision-makers within politics and business that they may have more options than they knew of. - The articles and opinions published on the blog will mainly be within the frame of our vision and concept, says Anders L. Hansson. In today's Europe where integration is a keyword and regionalization an essential factor, Annors Development can provide new ways to analyze society. Last year Annors Development performed a mission for an international NGO. Currently, company founder Anders L. Hansson is studying politics of Catalunya and Spain on-site in Barcelona, subsequently writing analyses for Skånska Dagbladet, a leading regional daily in Malmö, Scania (southern Sweden). - Annors Development is a fresh and sound alternative on the market for analysis. "Europe of Regions - A World of Regions" is a good starting point. We help decision-makers in business, politics and government administrations draw the right conclusions, Anders continues. - Some opinions published on the blog will for sure not be within present mainstream ideas in, let's say, Sweden. But today analyses have to be put in a European and global perspective. If business and politics fail to do so, they will lose the global competition game, Anders sums up. A group of influential individuals from politics, business and culture came together on Saturday 5 March to discuss problems and prospects of Scania's regional autonomy. The future-oriented meeting took place in a solid historical framework at Skivarp's Inn . - Today's initiative is an important first step to find common ground for a stronger regional autonomy, says Anders L. Hansson, one of the participants. This pro-autonomy group is a sound political and organizational platform to build on. Visible results of the new group's activities are to be expected in a few months. The development of the European Union forces states all over the continent to overhaul their constitutions in order to meet the challenges of regionalization and internationalization. Federal solutions - well applied - have a great potential that can offer practical approaches also for states that currently are of the unitary kind. The Center Party of Sweden has started to realize this and did therefore in 2003 adopt federalism as a foundation for its policies. In 2004 a thesis competition was announced to provoke a more lively debate also in Sweden. Even though written in 1997, Anders L. Hansson's thesis on the 1994 constitutional reform in Germany, turned out to be a winner. The prize ceremony took place in the Parliament of Sweden on January 25th 2005. In connection with this, a seminar on federalism was held, and also broadcast on national tv. Commenting on the thesis of Anders L. Hansson, professor Mr Olof Petersson of Uppsala University said that it's of "extraordinarily high class". In addition - and despite its eight years of age - "it is in many aspects directly applicable" in the work of the two parliamentary committees that currently are working on how to distribute powers and responsibilities in Sweden, the professor said. Anders L. Hansson took the opportunity to warn that centralization can be a danger also in a federal system. Even though chances for regional self-determination are much better than in a unitary state, there's no guarantee that federalization gives border regions - such as Scania - fair possibilities for transborder cooperation. Answering a question from the audience on how to achieve a broader and more vivid debate on federalism among citizens, Anders L. Hansson pointed out cultural and identity issues, since they are fundamental for the legitimacy of regional democracy. Participating in the seminar were also two other award winners - Mr Richard Hellner and Ms Anna Johansson - as well as Center Party parliamentary group chair Ms Åsa Torstensson, Member of Parliament Ms Kerstin Lundgren and Mr Henrik Sjöholm, chief ideologist of the Center Party. Read a brief summary of the thesis in English or the full version of the thesis in Swedish. And here you find the press release from the Center Party. Starting January 2005 Anders L. Hansson will be back as an independent columnist in Skånska Dagbladet, a leading regional daily in Scania, Sweden. Anders hopes that him being back as a political analyst in one of Scania's leading dailies will provoke more creative ways of thinking on the future of the region. - In today's Europe where integration is a keyword and regionalization an essential factor, Stockholm-centered analyses can no longer provide us with the understanding we need to make progress and survive in a globalizing world. This is a fact, not only for Scania, but also for most of Sweden. Scania and other regions in Europe have to realize that their destiny must be seen in a European and global perspective. It's not a first for Anders. Back in 1997 he was assigned as a staff editorial writer at the same newspaper. Building on his international background and many years of experience in government, NGOs as well as various industries, Anders L. Hansson now takes on the challenge to analyze Scania and its surrounding political and economic landscape with an innovative approach. - Skånska Dagbladet offers a different platform than the Internet. The classic editorial pages of the big newspapers still have an important role in today's society, Anders summarizes. For those who do not have access to the paper edition of Skånska Dagbladet or simply would like to maintain a better overview, Annors Development offers the option to follow - and debate - the columns in the blog section here at www.annors.com. Annors Development performed a mission for Unrepresented Nations and Peoples Organization (UNPO) - an international NGO based in The Hague, The Netherlands. - The UNPO is a unique human rights organization since it's run by representatives of the nations and peoples that form the focal point of all the organization's activities. Another important feature is that collective human rights are a priority to the UNPO, whereas most other human rights organizations are promoting individual human rights, Anders explains. Since early October he's been on-site at UNPO headquarters, assisting in the organization's political and financial endeavours. - The UNPO is an extremely important initiative, founded back in 1991. Working together will hopefully allow its members to achieve recognition and political influence. Anders' duties entailed traveling to Finland, Sweden and Denmark, where he promoted the UNPO in several ways. Fundraising was an important issue in all three countries.